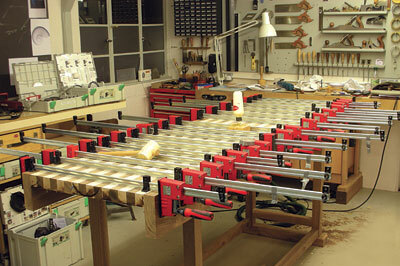 "You can never have enough clamps." Or so the saying goes. How true is this? 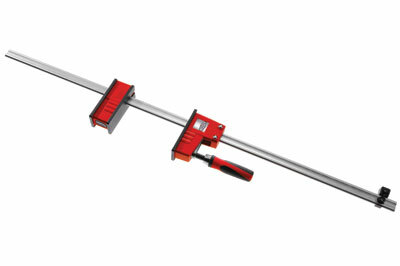 After testing the entire range of Bessey Clamps we placed a very large order, which included members of our student intake and regular bench-space members. I think that is an endorsement of the quality of these clamps and almost requiring no more space on the page but I will however, explain a little about the Vario KRV Revo clamp. These are a little expensive but the versatility easily makes up for the cost. The unique feature of these clamps is the adjustable end clamp that can be slid up and down the clamping bar. This means no more pins dropping on the floor, which seems to be commonplace on many traditional sash clamps. It also means you can put the work piece in the centre of the clamps and have an equal over-hang of steel bar. This is where the savings can be made; you can buy slightly longer clamps than you would commonly need and use them without being too unwieldy. The Revos can be joined together using the very strong optional joining sections and are easy to adjust. The end clamp is moved by pushing a button and sliding to the required position. The screw clamp is tilted and slides up or down. The process is quick, smooth and remember, no pins dangling on chains. You may think that plastic clamp ends and no positive locking system would equal a reduction in clamping pressure. On the contrary, these pull and push an amazing 7000nm or approximately 5000ft/lb. And yes, that was pull as well as push; you can rotate the heads and use them as spreaders. Mighty handy if your glue-up isn't going to plan and everything has to come apart quickly. I found the Revos unrivalled in their ability to clamp up square. The heads stay perpendicular to the bar even with extreme pressure and with a generous clamping area the load is spread over a larger area than with sash clamps. There's only so much a wooden block can do. The Revos come with a plastic T foot and combined with the large heads they are very stable on the bench when you are laying out for assembly. Two removable spacers keep your work away from the clamping bars avoiding excess glue sticking to the clamps and preventing stains from the metal appearing on your work. We have been using the clamps for two years and they have not let me down once. They are so quick to adjust that you can quickly grab one when you need extra pressure to help close up a join. A wise decision is only made once and a good investment will last a lifetime. I am happy I made the right one.